Abusing the power of keywords can have ill effects: A poor user experience, rejected articles, and a spammy website. If everyone tells you that harnessing the power of keywords can help you reach your audience and increase your exposure, but it can also have a backlash, then what should you do? Discover what keyword stuffing is and how to avoid it. Keyword stuffing occurs when an article or webpage is chock-full of keywords in an attempt to increase a website’s search engine rank. There’s a large variety of keyword stuffing tactics that we’ll cover in just a bit, but let’s talk search engines first. Most search engines don’t use keywords beyond the second occurrence to determine relevance for users. For pages with more than a second occurrence, the search engine will begin to look skeptically at the intention of the webmaster. Should the search engine detect keyword stuffing, it will forfeit the page rank because these pages often lack useful content and create a poor user experience. Are you looking for cheap skinny jeans? If you’re looking for cheap skinny jeans, look no further. Our cheap skinny jeans website is the best place to order your new cheap skinny jeans. Feel free to check out our selection of cheap skinny jeans from our cheap skinny jeans selection. … personalized collar can be designed in the style that you want. Search Engine Optimization. You’ll have your choice of exactly how the collar will look. In addition to the above, hiding keywords is another keyword stuffing tactic you should avoid to preserve the integrity of your website. This spammy tactic involves coloring text the same as the background color, positioning blocks of keywords off the center of the page, or hiding keywords behind images so they can’t be seen. Don’t think about it! Focus on creating useful, information-rich content that uses keywords naturally within context. If you insist, limit yourself to 2 keywords or keyword phrases for every 100 words. Be relevant. Only use keywords that are relevant to your topic and your niche by considering how users would search for you. Want a better tactic that’s far superior to keyword usage? Create buzz by continually offering new, readable, compelling, informative, and original content. Stay fresh in the minds of readers and search engines with a great user experience. Have questions or comments? Share them in the section below – we’d love to hear from you! *For more information regarding the Long-Tail Method, click here. Fresh, informative and usable content is the best way to build traffic! Can I add, for those writers who get scared off using keywords by what they’ve read here, that there’s no need. 1. Make a list of the keywords you think will help you to rank well for RELEVANCE to the article you’re just about to write. 2. Construct the long-tail keywords that you think will help, too (follow that link above). 3. Outline the article – most people do this by briefly noting what’s in each paragraph, following the structure plan for template you’ve chosen. TIP: you can occasionally break a long-tail keyword over two sentences to avoid unnatural-looking overuse. For example, if the key-phrase is “Stainless Steel Microwave Ovens”, you could end a sentence with “are best lined with stainless steel.”; then begin the next paragraph with “Microwave ovens will benefit from…”. To the search engines this is simply that long-tail key-phrase. See? But don’t do this more than once or twice per article, and only if it follows the natural flow of the text. If it looks strained, it is! 5. Re-read your article for typos, grammar and natural flow. As you do it, consider each keyword and key-phrase as you get to them and check that they’re relevant to your text at that point and sound natural. You might want to add more keywords, take some out or substitute from your list. 6. Get the whole article checked. First by the automatic spelling and grammar checker in a program like Word, with the grammar checker set for the style you’re using; then by a competent friend for those typos and grammatical errors that slip by the machine; then again for style and ease of reading. 7. Finally, submit it, and see what the EzineArticles.com editors think! Hey – it’s a 7-point article! Maybe I should become a copywriter? This is amazing information! I’ve really hit a brick wall with all of Google’s new updates but this gives me new life and a new desire to write more content for my site! Thanks! Good article. Enjoyed reading it. Articles like this help others to get it right sooner, rather than later. The one thing I have learned about the use of keywords, is that you never get it right the first time. It takes practice, and learning from others who are better at it than myself. And when I do wind up with an article or post that makes the top 3, 5, or the first browser page—I go back to study how it was written…. After having done this, I use them as a guideline first, then look for ways to improve for future rankings. Also, though I do not know if it is a good idea or not—personally, I don’t see a thing wrong it—I am considering going back and rewriting posts I have already written. To improve there rankings. Unfortunately, because so many SEO companies have abused article writing as a marketing method, search engines -Google in particular- are probably more likely to consider an article that uses an overabundance of keywords to be spam and lower the importance they give you in its search engine algorithm. So article writers should be be more conservative in their approach to using keywords and avoid using the same exact keyword in the title, anchor text and any subheadlines. Better safe than sorry. I know next to nothing about keywords and SEO, have bettr things to think about and do. Content, since the Penguin and Panda era, is rewarded. My blog, which isn’t optimized but is well constructed for the most part, went from a ‘4’ to a ‘2.’ What exactly this means, I am not sure, but a ‘1’ is a major, Amazon type, site. A friend who is cybersavvy, indignantly said ‘How could YOU be a two.” So it’s an achievement. My blog has a large amount of fresh content on the same subject, with graphics, and has some comments most every day. That’s all it has. So content, nakedly, is rewarded by Google. You’re right, Emily! Good content is rewarded. You are probably doing SEO the way Google intended: you use the right key words in the right places in your articles, and they recognize that you have quality content. Well done! Actually Emily, I think 2 is WORSE than 4 in Google. 10 is the BEST page rank you could get. Page rank, yes – but I reckon Emily means place on the results page (after the ads, of course). As a certifiable naif on this subject, all I can say is: Whatever it was, my friend in the same business, who posts articles of others as if they were hers, and modifies them with her remarks, and does back links, and all that stuff, was miffed that my two was better than her four. She had been a three. Don’t know what it is she was speaking of. Her site is elaborate and cluttered, and has stuff which is off her topic. She had been on the first few on some major Google pages, and she was wiped off of any listing. A disaster for her. At the same time, my site (which gets very very little traffic, maybe fifty regulars, went up. I started to get some callers who had Googled some odd things and ended up with me. My site is very clean, very focused. If any of you cyberwise folks want to look at it and tell me anything, I would be pleased. It’s http://TarotVerbatim.com, dedicated to the fact that Rider Waite Tarot -through the pictures on it – yields cogent and useful information to whoever visits my site via a logic- and language- based system I discovered (as part of a science experiment). It’s great brain exercise quite apart from the messages. Great article, thanks. Keyword stuffing is so clearly explained. I hate keyword stuffing. Keyword density is like 50% and the articles are tough to read. Don’t ever do keyword stuffing. Strive for a keyword density of around 2-3%. You should be good here. Thank you for your advice. I will try to follow the suggestion of limiting to two keywords for every 100 words.I will also try not to use common words as keywords. Relevance of the keywords is very important. I hate keyword stuffing. People don’t like reading crammed articles and certainly will not link to it. I would like to point out that things are moving towards a better search result outcome for quality, original and helpful websites or pages which do not have keyword stuffing and other such artificial ranking methods which is ell overdue but thankfully it is happening. However,what makes me upset at times is that there are still countless number of sites run by people who are not even close to being an expert in the field (nothing wrong with that ) but who have articles that were published by experts rewritten so they pass the Googles non duplicate filter and pass this content as their own. Worse than that, as I discovered by chance is happening to many of my articles, these people copy the whole article or change a word here and there and put their name to it without even acknowledging the source, let alone including the bio box with links intact. I do not have time, as I am sure most of the people reading this (if any) would not have either, to enforce copyright and besides the duplicate content does not count as far as I understand it but it can spoil it for the original publisher of that content, from what I’ve read, but am not sure in what way is it harmful for the original publisher. Just venting my frustrations. Thanks for reading this. Google can and does mistake their article for the original and penalizes you. I have had the site of people who have done this article stealing, and the sites of people who have used my domain name for ads taken down. Yes, it is time consuming. The individuals are arrogant as hell. One told me I wasn’t the only person who owned my site. I found my entire site, with all the past blogs and its scrolling comments, on a site. I even found Self Growth’s site on some real estate lady’s tiny one – and you could operate on it just like on the real one. The unmitigated gall of these creeps! Self Growth is a huge site, or was then. There’s a site that has several of my articles on it, brazenly changed to match this person’s opinions. She has stolen lots of articles from lots of people, thinks she’s smart to do so, and wonders why Google dropped her from number one to number nothing. The experts I read say there’s nothing much you can do about it unless you want to take the time and trouble. Thanks Emily. I have read many stories from website owners about the blatant theft of their website like you mentioned in your case, very unfortunate for you. In the case of Jeremy from shoemoney.com, a very well known marketer, he mentions about how this theft really touches his buttons and he goes all out with his legal team in about 30 cases to pursue these people. Many of these people who steal content, or a whole website like in your case, are counting on the fact that a few affected website owners will actually spend the time and money to sue them. I think the process goes something like this in the US legal system. You have to send an cease and desist letter to the website owner, often you need to find their contact details by a subpena to a isp, domain registrar and so on, because they are hiding behind domain privacy. This letter is apparently in most cases disregarded, so you end up going the legal path which will end up costing a fortune and then if you win you can’t really get compensated properly if you did not actually send your material, images etc to be copyrighted (not talking about having a copyright sign at the bottom of your site). So you would be lucky if you break even, after wasting your precious time on these low lives. I know that as an owner of content it’s our duty to enforce the copyright, but unless you are in the big league and have resources behind you it would not be worth it. This is an area where we need more regulation on the web because there is theft and injustices everywhere if they know they can get away with it. I do not want to be seen as negatively orientated and a whinger, but again, just needed to vent my frustration on the unfairness of the system. There should be more done by Google and others to make it harder for those out there misusing the system. This is a great article, coming from someone who is just starting out! Where I get nervous, is in the writing itself. I’ve tried to not be spammy. Yes I care about traffic, but its not my priority this early. I’ve started a website about fantasy football. I guess I’m entirely sure how to “keyword” my website, as everything on it, orbits fantasy football. Any ideas or generalization you can help me with? Well information in this article about keyword stuffing. I read this article and find great information. Keyword stuffing is certainly not a good idea and it never made any sense to me anyways. It just gives the sentences a meaningless addition at times. Google to is not very appreciative of this stuff so I definitely never do it. I would like to know your thoughts on Pure Spam though. What do you think are the best ways to save a site from that? Unfortunately spam is something we all encounter and it can be quite discouraging when trying to keep your site spam-free. We recommend setting up any comments or content on your site as needing reviewing prior to being able to post. That way you are able to moderate the content on your site and remove any spam before it is live. Thanks for share, this is good information I have bookmarked…. Great post, I am NEW to seo and this information is invaluable to me. I am reading so much on the rights and wrongs it is very difficult to know what to do for the best. Great Post. I have come to know a lot on keywords stuffing and ethical seo. 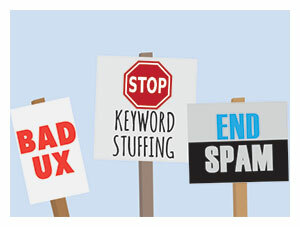 Informative post i got clear idea about keyword stuffing . maintaining keyword density 2-3% is better way to avoid keyword stuffing……. I understand how in some posts, the keyword in question can sound very unnatural when inserted multiple times. It sounds like ‘selling’ as opposed to being informative. But in the training I’ve had, it was hammered-home that the intended keyword should be used every 100 words. Are you recommending that theory? Ben, you’re thinking of (and were maybe taught by people still in) the Bad Old Days, when content spamming, keyword stuffing, and so on actually did get ranked well. Google et al have now spent a decade improving their algorithms to detect such stuff automatically and either ban it or de-rank it, depending on severity of offence (the Search Engines, in their advice to programmers and content writers, clearly warn against these things). As things have tightened up, so the old advice to improve your rankings ‘legally’ has had to change, if you want to avoid being caught up in the spam and bad website elimination. Today, there’s simply one rule to keep clean and rank well: provide what people would really want to see when they search for something. The Search Engines are now very, very good at detecting web pages which try to ‘game’ the rules or are simply bad providers. Make your stuff topical to the search, full of useful content and interesting to read. Be a true authority, with whom other authors want to link to help their own readers find out more. And keywords? (i.e., the words people enter in a search box.) Once on a page is enough, in the right place and conditions; a few times more won’t hurt. But every 100 words? Spam! It simply isn’t natural, and Google at least will downgrade you for doing this today. There are lots of modern guides to this on the web, but can I point you to two sources – probably the world’s most authoritative? 1) Matt Cutts’ videos on You Tube – he’s Google’s chief technical front to the world. 2) Jill Whalen’s free High Rankings newsletter at http://www.highrankings.com/newsletter/. Her tips are second to none, and a subscription to this will keep you up-to-date with changes as they happen. Her archive of articles has all you need to know. Wonderful tips, will surely apply to my website.